ĐÀ NẴNG— Several large cracks have appeared in the roof and walls of the Hải Vân Tunnel in recent months, causing safety concerns. The Hải Vân Tunnel was put into operation 11 years ago, but cracks and leaks were detected just a short time after it opened. Contractors fixed them by applying special glue, but the problems have continued to surface. The cracks and water leak are a matter of great concern to drivers. There are long and deep cracks along the tunnel’s walls, some 1m to 7m long, and some even 12m long. Several cracks in the roof have caused water to leak into the tunnel. The cracks now have become serious and occur at many places. 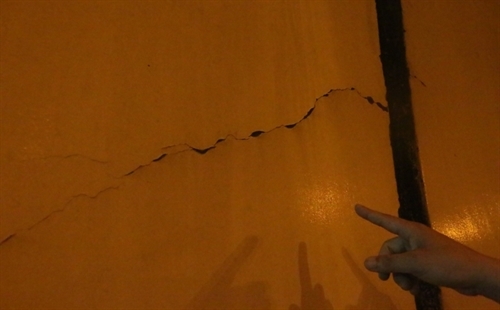 The management board is monitoring the situation and is preparing measures to fix the cracks. According to a report by Japan’s Nippon Koei – a consultant company - along with cracks and leaks, many of the equipments in the tunnel are out of order or are in poor condition. Fire-fighting equipment has not yet been installed in the tunnel, while the electrostatic dust precipitator, fans of ventilation systems and cooling machines stopped working a long time ago. Deputy Minister of Transport Lê Đình Thọ said this was a major problem, but added it could not be resolved overnight. In May 2015, the prime minister approved a plan for Hải Vân Tunnel No.2, with four lanes, on a build-operate-transfer basis.